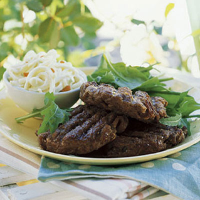 You'll find that the organic chestnuts add a fabulous nutty flavour and texture to these veggie burgers. Melt the butter in a large frying pan over a low heat. Add the onion and cook for 5 minutes or until just softened. Add the garlic and thyme, and cook for a further 5 minutes. Roughly chop the mushrooms and half the chestnuts into ½-1cm pieces. Add to the cooked mixture in the pan and increase the heat. Stir well to combine and season to taste. Cook for 5 minutes or until any liquid has evaporated. Spoon half of the mixture into a large bowl. Place the remaining mixture and the remaining whole chestnuts in a food processor. Blitz to make a stiff paste then stir this into the original mixture and leave to cool completely. When cool, mix in the mozzarella. Using dampened hands, divide the mixture into 6 and shape into rounds 2-3cm thick. Set aside and chill until needed. Using the preheated barbecue or a non-stick frying pan, over a medium heat, cook the burgers for 8-10 minutes before carefully turning over with a wide fish slice. Cook for 5-10 minutes on the other side, or until golden. Serve hot with plenty of salad, such as Waitrose Spinach & Roquette Salad or coleslaw and 'damper' rolls. Using a wide fish slice when turning the burgers, it will help to keep their shape. It's easy to reshape them, if you need to because they are very forgiving.